Perrot-Minot's 2006 Vosne-Romanee Les Beaux-Monts Vieilles Vignes smells hauntingly of iris, narcissus, and heliotrope hovering over ripe cassis and blackberry. Musky, sweetly-perfumed floral threads weave their way throughout this richly-textured Pinot, with mace and vanilla accentuating its sense of sweetness. For all of its seductive lushness, this is underlain by enormous though fine-grained tannins, and I suspect it would be best to wait 2-3 years before revisiting what should be a candidate for a decade or cellaring. The 2009 Vosne-Romanee Champs Perdrix covers every inch of the palate with masses of dark fruit, tar, licorice and spices. Today the 2009 comes across as big and massive to the point of being awkward in an adolescent kind of way. 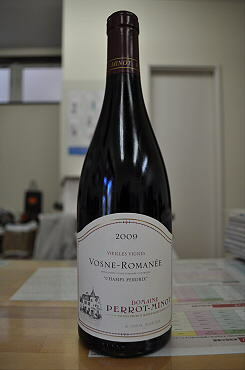 The 2009 needs time to drop some of its baby fat and develop its full range of aromatics. Still it is impossible to miss the sheer pedigree here. The intensity is superb. Perrot-Minot used 20% whole clusters here. This is a terrific, hugely delicious Burgundy. Anticipated maturity: 2017-2029.